synopsis (EN) In the story-based career mode, players can invest any experience points they collect in improved skills and equipment for their characters, and work their way up from beginners to world-class athletes. All of this takes place within a gripping story in which the player takes part in 16 competitions against four national teams. As an added challenge, one of those teams is the player's ultimate rival, and particularly hard to beat. RTL Winter Sports 2010 also provides "casual" entertainment: In single discipline mode, players get to take part in the event of their choice in order to hone their skills in that discipline. Veterans also get their money's worth in RTL Winter Sports 2010. The extended trick system for the disciplines of boardercross and freeride skiing provides the ultimate challenge for experts. 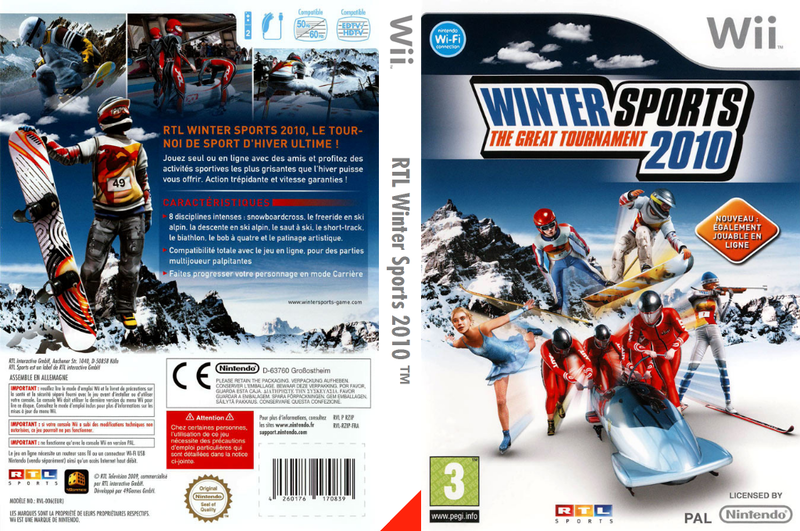 RTL Winter Sports 2010 will also thrill fans of multiplayer games. Up to four friends may compete for the top position in the championship rankings - there can be only one champion, after all. Game Play This year's edition of the winter sports simulation was completely reworked in order to use the next gen consoles' functions to their greatest advantage. 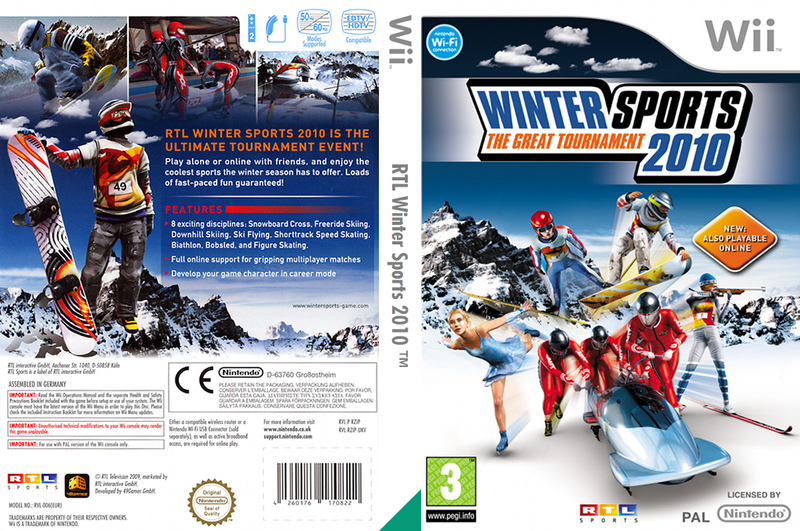 Apart from the attractive sports such as boardercross, ski flying, Alpine skiing, freeride skiing, short-track speed skating, figure skating, bobsledding, and biathlon, players of RTL Winter Sports 2010 also have a complex career mode to look forward to. Eight unique sports disciplines and full online support for all platforms for the first time ever, make for hours of gaming fun. The online mode "fair play" launches an event where each participant controls an equally skilled athlete, thus showing the players' real strengths and weaknesses in every discipline. On the other hand, the players' individually trained avatars get to compare their abilities in the online "tough mode". Eight unique and distinct sports: boardercross, freeride skiing, Alpine skiing, ski flying, short track speed skating, biathlon, bobsledding, and figure skating. Five game modes: career, cup, single course, campaign, multiplayer. Four difficulty levels: easy, normal, hard, extreme. Fair play strips help identify "good" and "bad" players in the career and online modes; the players' behavior is immediately reflected in the fair play strips. Story-based career mode with role-playing elements, special skills, and upgrades. Campaign with 44 gripping challenges. Multiplayer: online and split-screen modes (up to 4 players). Online mode with a world-wide ranking system. Extended trick system for boardercross and freeride skiing. Appealing commentators create an authentic competitive atmosphere. Next gen system of graphics and physics. Vorherrschaft in der Rangliste kämpfen, um letztendlich den Sieger in den Disziplinen zu küren. synopsis (ES) ¡Participa en el torneo definitivo de deportes de invierno! Juega solo o conectado con tus amigos, y disfruta de los mejores deportes que la temporada invernal tiene para ofrecerte. ¡Horas de frenética diversión garantizada! synopsis (NL) Winter Sports 2010: laat je acht verschillende wintersporten beoefenen. Waaronder skiën, bobsleeën en kunstschaatsen. 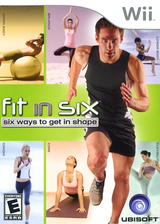 * Vijf verschillende modes: Career, Cup, single course, campain en multiplayer. * Op een verhaal gebaseerd carière mode met role-playing elementen, speciale vaardigheden en upgrades.